It's a massive project with 70% of its funding coming from public moneys from the Romanian State. . . .
Alright there, everyone. 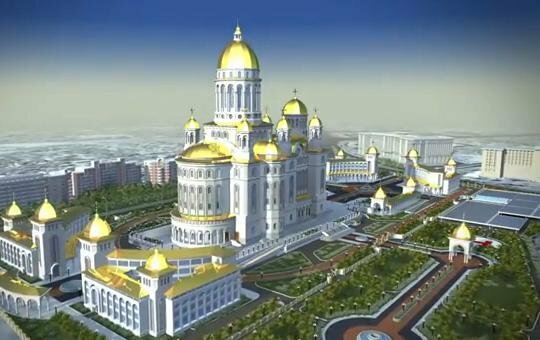 Romania builds the biggest Orthodox Church in the world! That's what we'll be talking about on today's video. The Romanian People's Salvation Cathedral in Bucharest was just recently consecrated this past November. It was, by all accounts, a very moving and powerful consecration ceremony. The Patriarch of Constantinople, Bartholomew, who is currently experiencing a lot of controversy himself over his decision to grant autonomy to the Ukrainian Orthodox Church (but that's a whole 'nother matter there) . . . It was officiated by Patriarch Bartholomew as well as the Patriarch of the Romanian Orthodox Church, Patriarch Daniel. Over 30,000 people attended from all over Romania as well as 2,000 official guests such as Prime Mininster and other members of the government as well the constitutional court president. In fact, the crowds were so huge, were so big that they had to follow the ceremony on large screens, you know, Jumbotrons outside. This construction of this massive cathedral began back in 2010, and it's still not fully completed. It won't be absolutely complete until 2024. It's a massive project with 70% of its funding coming from public moneys from the Romanian State. The cathedral stands nearly 400 feet tall. It covers an area of 150,000 square feet. Its main bell is one of the biggest in the world weighing an estimated 24 tons, and its sounds can be heard in half of Bucharest. The cathedral has eight elevators. Eight! And it has two multipurpose halls equipped with altars that can function as churches in their own right. There are 42 crypts in the basement. There's a full museum housing an exhibit on the history of Christianity in Romania. And it has, also, several spaces for high tech media communication. It stands right near the Parliament's Palace and was consecrated around the time Romania celebrated it's 100 years of their great union, the birth of modern-day Romania and around the time of the Feast of Saint Andrew, Romania's patron saint. And in the words of Patriarch Daniel, "The Cathedral serves as a representative National Cathedral which symbolizes faith, freedom, and dignity of the people of Romania. Nearly 90% of the population of Romania is Orthodox Christian, and, indeed, as the BBC is reporting, the cathedral, in many ways, is really just the climactic representation of Romania's recent love affair with church construction. Romania has been in the middle of this mass church building boom with approximately ten new places of worship completed every month. And keep in mind, these aren't little tin shacks that we can often associate with American Protestantism; these are Eastern Orthodox churches, sacred spaces that are built to last forever. But there are, of course, very loud critics who see the use of public moneys on such building problems as little more than a waste. They argue that Romania is one of the poorest countries in Europe, with a failing infrastructure, dilapidated hospitals and schools. Wouldn't such public moneys be put to better use if they funded such public projects as these roads, schools, and hospitals. Now, what Western media often overlooks is that this criticism of the cooperation between Church and State often does come from ex-Communist officials in the lingering secular Marxist ideology among Romania's intellectuals. They are arguing for a very severe separation between Church and State, which, of course, is standard fare among secular globalists. And, to be fair, there is a legitimate concern that this is little more than an attempt by public officials to "buy off" the Orthodox Church, which is, pound for pound, the single most powerful organization in Romania. In other words, bureaucrats give the Church tons of money in exchange for the Church's support in their electoral campaigns. Right? Sure, of course that's a concern. But what's so interesting here is that such support doesn't come from this party or that political party; it tends to be pre-political support. 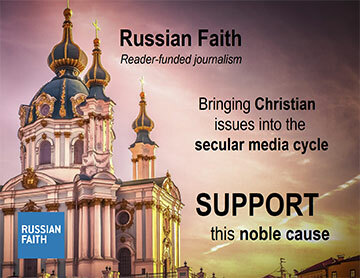 In other words, public moneys are used for the bolstering of the Orthodox Church, not as a campaign issue per se, but, rather, as part of the foundational cooperation between Church and State that's marked Orthodox societies for centuries. This is something that Western media types like the BBC have a hard time understanding. Romanian society, like the wider Byzantine world, has been historically characterized by the political doctrine of what's called "Symphonia," or the cooperation between Church and State as a manifestation of the unity between Heaven and Earth in the Incarnation of Christ. Church and State work together a a lived-out extension of the reunification of Heaven and Earth in Christ, Who is fully God and fully man. So there is no separation between Church and State in the strict separationist sense. There is, of course, a distinction. The State is not the Church, and the Church is not the State. Historically, this has been worked out in terms of the Sacrament and the Sword. The State is allowed to use the sword, force, in the defense of the homeland, while priests were forbidden from taking up the sword since they are called to reveal God's love even to those who threaten them and the homeland with violence. This is the way the Church has brought together just war theory, self defense imperatives that are necessary for the protection of the weak and the infirm in the nation and Christ's call to turn the other cheek. So this distinction between Church and State is, of course, very, very important, an intrinsic part of a distinctively Christian social order. But this distinction does not entail separation - not in the hard sense, not in the separatist sense like what we see advocated by globalist secularists. Instead, the Church and State, though distinct, have historically worked together in an accomodationist relationship - not a separationist, but an accomodationist relationship - as the two work together for the benefit of human society as a whole. But what about this notion that such public funds would have been better spent on schools, and hospitals, and infrastructure, projects? This is where secular globalists completely fail in my opinion. And they really expose why it is that they can't be trusted with culture, custom, and tradition. I remember hearing a lecture online by the contemporary artist and painter Makoto Fujimura. And he was reflecting on a life-changing event that happened to him some years back, before he became very famous. I believe he and his wife - they were newlyweds living in a tiny apartment in New York, and they were literally counting every single penny. Right? They were eating discount foods, and scraps, and just scraping by as he was trying to make a living as an artist. And one day, his wife came back from the store, and Fujimura was shocked to find that she had bought a beautiful and expensive bouquet of flowers and put them in the middle of their small apartment there. And Fujimura - he was just, you know, very upset. And he like, "You know, we're scraping every penny here for food. We just don't have enough for luxuries like this. Why are you buying this?" And his wife looked at him and said something like this: "We have to remember that while taking care of our bodies we don't neglect the nourishment of our souls." Now, we noted the irony of this. He was the supposed artist. He, of course, should have known better! But even artists need reminders. Man does not live by bread alone, but by every word that comes out of the mouth of God. We were created for art, and music, and poetry, and literature, and movies, and flowers, and the fragrance of springtime, and, yes, for sacred space and architecture. Indeed, architecture is probably one of the most significant of the art forms for our human development, and this is because we're inevitably products of our space in that the spaces we inhabit inevitably shape us and form us. The spatial and temporal dimension that we inhabit has an enormous influence on how we imagine the world to be. For example, Keith Lilly's study on medieval urban planning has highlighted the myriad of ways in which the City functioned literally as a map of Christian belief in meaning. The walls that encircled the medieval city represented the cosmos, while the four gates to the city represented the four Gospels, as it was in the form of the Cross. The orthogonal, or straight, layout of the city streets not only themselves created crosses, but were said to represent the call of Isaiah 40, "make crooked the straight and make straight the dessert, a highway for our God." The architectural design of the cathedral at the center of the city sought to explicitly transform the world into a vision of new creation, provided the center for various festivals and public processions that affirmed Christianity as the foundation of the life of the city. In terms of classical Christian architecture and its use of geometric representation, the circular dome represented heaven, with the circle representing eternity. The four corners of the floor represent the four corners of the earth. Particularly Byzantine churches tended to be a perfect square representing the Holy of Holies. Often there were four pillars that stretched down from the heavenly dome to the earthly floor, which represented the four Gospels testifying that Heaven has come down to Earth in Christ. And, of course, the cruciform became the standard floor plan in the Christian West so that every church was a tangible representation of the world recreated through the Cross. What all of this created was something we might call a sacramental epistemology in that the purpose of this architectural splendor and urban planning was to awaken the imagination and the senses of the liturgical participants to the restoration of Paradise in the transformative life, death, and resurrection of Christ. It is through this architectural mediation that the citizen is invited to see the world as a distinctively sacramental vision. And beauty was indispensable to this awakening, for it is in the architectural revelation of beauty that our dispositions, inclinations, and desires of the human person are directed like a gravitational pull to the Kingdom of God in Christ. So, in this sense, the beauty revealed through the organizational sacred space awaken the participant to the trajectory of the entire cosmos as it's dynamically being led up into the inner life of God revealed in Christ. And the important point here is that without this architectural mediation, without this sacred space and the awakening of a sacramental epistemology, there would have been no such apperception on the part of the citizen. The world would have been seen through very, very different eyes - dare I say it - through the sterile, apathetic epistemology of the modernist globalist in whose world there are no cathedrals, there is no sacred architecture, there is no care for beauty and for the nourishment of the soul. This is the highly sterilized vision, the concretized vision of your globalist modernist, one who wants to gain the whole world yet lose his soul in the process. I am very happy to report that Romania wants nothing to do with the secular globalist monstrosity. They are turning, once again, to culture, custom, and tradition in its incomparable beauty as the means by which a truly human and humane society can prosper and, indeed, flourish.